Autumn has turned to winter, and it was a cold and frosty morning this morning, with temperatures hovering between 0 and 2 as I left the house for Christ Church Cathedral. I was the deacon at the Cathedral Eucharist this morning, reading the Gospel (Luke 23: 33-43) and assisting at the administration of the Holy Communion. Today, the Sunday before Advent (20 November 2016) marks the Feast of the Kingship of Christ. The Dean of Christ Church, the Very Revd Dermot Dunne, presided at the Eucharist, and the setting was the Mass in G by Franz Schubert (1797–1828), sung by the Cathedral Choir. Later, four of us went to lunch in Mykonos, the Greek taverna nearby in Dame Street. But by early afternoon, it was obvious that darkness was soon going to close in, and two of us decided to travel up into the Dublin and Wicklow Mountains for a brisk walk in the sharp early winter weather in the Glenasmole Valley. The Glenasmole Valley is home to the Bohernabreena reservoir and waterworks and is managed by Dublin City Council. The reservoirs supply water to about 35,000 households in the southern central part of Dublin city. Glenasmole is about 5 km from Tallaght. The Glenasmole valley is a designated Special Area of Conservation and has several different habitats, some of which are listed under the EU habitats directive. Glenasmole was formed during the ice age by a glacier and consists of two valleys. The higher valley was shaped by upland and lowland glaciations. The lower valley is more deep and narrow. The Glenasmole Valley features in Irish mythology and the many stories and legends about Oisin, Fionn and the Fianna. The Bohernabreena Waterworks, stretching from Bohernabreena to Casltekelly, were built in 1883-1887 and work began on the reservoirs in the 1880s to serve three objectives: flood control, a supply of drinking water and water to the mill owners in south Co Dublin. There are two reservoirs. The upper lake with cleaner water from the lower, non-peaty slopes of the mountains provides drinking water; the lower lake contains peaty water from the upper slopes the supplied the numerous mills down the Dodder. The stone-faced channel that runs parallel to the upper lake brings water directly to the lower lake. The water is then brought to Ballyboden, 7.5 km away, for treatment. Over 100 years ago, the two lakes were quite bare around the edges. Now, with a mixture of planting and natural colonisation, there is a mixture of larch, Scots pine, Corsican pine, Douglas fir, hazel, birch, ash and sycamore. Recent proposals by the National Assets Management Agency to sell of much of the Glenasmole Valley has upset many people who enjoy outdoor walks in this part of the Dublin and Wicklow mountains and threatens proposals for the development and expansion of the Wicklow Mountains National Park. This park has been developed carefully and strategically over the past 20 years and is one of the great conservation stories in Ireland. The aim is to eventually have a national park of 75,000 acres, but NAMA is planning to sell the 5,000 acres of land it holds and that make up a key element of the planned park. The sale was proposed by NAMA even though this is a Special Area of Conservation and is of minimal commercial value. As dusk turned to darkness, we drove on from Glenasmole to Blessington in West Wicklow. Because I was working in London on Thursday and Friday, I had missed the light snow that fell in this part of Ireland at the end of last week. There was still some snow covering the peaks of the higher mountains, but the sky was clear and the temperatures were dropping as the winter darkness enveloped the mountains and the valleys, and the clear, dark blue skies, with some reflections of the long-set sun, gave a deep and colourful background to the bare trees. The East End of London was the stronghold of the Anglo-Catholic slum priests from the late 19th century until the decades immediately after World War II. One of the most colourful of these slum priests was Father St John Beverley Groser (1890-1966), who served in Christ Church, Watney Street, and Saint George-in-the-East on Cannon Street Road, both off Cable Street. Before coming to the Royal Foundation of Saint Katharine as its first Master after it was brought back to the East End. Father John, as he was known to all in the East End, was injured in the Battle of Cable Street 80 years ago in 1936, and there are signs throughout the Royal Foundation of Saint Katharine that are reminders of his saintly and heroic life. I was staying in Saint Katharine’s last week during a residential meeting of the trustees of USPG, the Anglican mission agency, and I was reminded of Father John’s legacy there and as I walked up and down Cable Street on Thursday and Friday. Father John was one of the most significant Christian socialist figures in 20th century Britain, and was once the best-known priest in the East End. He was the Vicar of Christ Church, Watney Street, from 1929-1948, and when this and other churches were destroyed in the Blitz, he became the curate-in-charge of Saint George-in-the-East and Saint John, Golding Street, from 1941 to 1947. He wrote only one book, yet he made an enormous impact on the Church of England and the labour movement, and through the Student Christian Movement and student missions, he had a major impact on the wider Christian community and on local struggles around housing, fascism, and the care of the elderly. Father St John Beverley Groser was one of 11 children of an American-born father, the Revd Thomas Eaton Groser, a missionary who had worked among North American Indians, and an English-born mother, Phoebe Wainwright, who had worked in Labrador. He was born on the Feast of the Nativity of Saint John the Baptist, 1890, in Beverley, a remote cattle station in Western Australia where his father was Rector – and so he was given the names St John Beverley. He came to England as a teenager, but retained a deep fondness for Australia all his life. In England, he went to school at Ellesmere College in Shropshire, one of the Anglo-Catholic schools of the Woodard Corporation. He then trained for ordination with the Community of the Resurrection in Mirfield. In 1914, he became the curate at All Saints’ Church in Newcastle-upon-Tyne, a tough slum parish where he was radicalised by his experiences. He was puzzled when the bishop complained he had been sent there to save souls, not bodies. At the outbreak of World War I, he became a frontline chaplain in France, where his experiences continued to shape his values. His commanding officer put him in charge of a group of demoralised soldiers in a time of heavy casualties. He was mentioned in dispatches in 1917, sent home wounded and received the Military Cross in 1918. Back in England in 1917, he met Mary Agnes Bucknall (1893-1970). They married in Saint Winnow, Cornwall, where her father was the vicar, and they had two sons and two daughters. Her sister Nancy married the Revd Charles (Carl) Threlfall Richards, who had been at Mirfield with Father John, and later he was one of Groser’s curates at Saint George's in Stepney. After World War I, he spent a year working with the Church of England Men’s Society in the Dioceses of Carlisle, Durham and Newcastle. He then went to Cornwall, as a curate at Saint Winnow’s. Meanwhile, Mary’s brother, the Revd Jack Bucknall, had become curate to the Revd Conrad Noël, the ‘Red Vicar’ of Thaxted, and introduced him to his Catholic Crusade. John was totally captivated by the ethos of Thaxted, where the Red Flag, the liturgy and the music were all of a piece, and later did temporary duty there. John and Jack organised many street corner meetings for the Catholic Crusade, always dressed in cassocks and flanked by the three symbols of the crucifix, the Red Flag and the flag of Saint George. Father John had no time for the Union Jack, and scouts at Christ Church were only permitted to parade the George, and their neckerchiefs, significantly, were red. He was beaten by police batons in the General Strike, and his licence was removed for a time. The new vicar, Father Kenneth Ashcroft, was a priest with Labour sympathies, but there were many conflicts with him and with Arthur Winnington-Ingram, Bishop of London. There were threats of sacking, and in the end, Groser resigned. During a year of unemployment, he did not sign on, as he had threatened, but supported his family by Sunday duties, selling life insurance, and some craft work. In 1929, he was appointed Vicar of Christ Church, Watney Street, within the parish of Saint George-in-the-East off Cable Street. A church that was facing closure was transformed. High Mass and Solemn Evensong, both with incense, were celebrated with Thaxted-style ceremonial. The church was re-ordered with a more open sanctuary, was lime-washed, and was decorated with banners of Saint George, the parish church, and banners of red representing the Red Flag. he made the earth for all men and not for just a few. God made and blessed and stationed for ever man’s desire. ‘Saint George for Merrie England’ re-echo to the sky. The first stage in the programme was establishing a classless and democratic Socialist State. The second step was establishing a World Cooperative Commonwealth of Socialist States. The congregation grew, but there were factional divisions among left-wing groups over Stalinism. 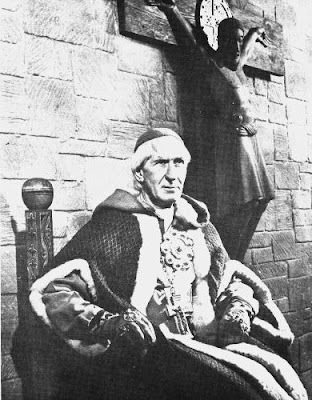 John and Mary Groser and the group at Christ Church were driven out of the Catholic Crusade in March 1932, and they then aligned themselves with other alliances, including the Socialist Christian League. Father John wrote and spoke extensively on unemployment, opposed means testing and the use of police powers over ‘loitering with intent’ against the unemployed, and worked on committees on poor relief and public assistance. Theologically, Father John was a traditional Catholic Anglican who saw God, and orthodox faith in God, as subversive. In a sermon in Saint Paul’s Cathedral in 1934 he claimed that nothing but the religion of the Incarnation, fearlessly taught and worked out in practice in a new social ethic, can save the situation. The Revd Jack Boggis, whose vocation had been inspired by Father John at Poplar, came to Christ Church as his curate (1932-1936) and produced the radical Christ Church Monthly. Later, he would succeed Father John as the rector of Saint George’s. Father John played a key role in galvanising opposition in the East End to Sir Oswald Mosley and his black-shirt fascists. He took part in the Battle of Cable Street 80 years ago, on Sunday 4 October in 1936, and had his nose broken by a police baton. From 1938, was president of, the Stepney Tenants’ Defence League, a broad-based grouping of activists, many of them Jewish and or Communists. It began with meetings in his vicarage. He later reflected in Politics and Persons how the tenants’ movement revitalised people from the defeatism of the depression. On 20 June 1939, the tenants of Alexandra Buildings on Commercial Street ‘built barricades of tables, doors and sofas at each entrance and a drawbridge to resist the bailiffs. Six were arrested for obstructing and assaulting the police.’ They held pickets at the landlord’s offices while both the Mayor and the Bishop of Stepney, Rabbi Israel Brodie and Father John argued the tenant’s case inside with the landlord for two hours. Politicians and bishops, priest and rabbis had been brought together to put challenge slum landlords. When he landlord agreed to stop the evictions and to negotiate, the barricades came down again. When World War II broke out, he displayed characteristically heroic care for his people and wrote scathingly about the arrangements made for East Enders. In 1940, he broke into an official food store and distributed rations to homeless people and organised buses to take them to safety. He was involved in the creation of a railway arch air-raid shelter in Watney Street. Father John’s ministry at Christ Church came to an abrupt end when the church and the vicarage were destroyed by a bomb on 16 April 1941. Saint George’s was blitzed the following month. The family moved to Saint George’s Rectory, and for the next six years he led the combined parishes of Christ Church, Saint John’s and Saint George’s, together with his brother-in-law the Revd Carl Richards, the Revd Geoffrey Lough, and the Revd Denys Giddey as his curates. A priest who was once on the margins was now becoming acceptable and acclaimed. He was in demand as a preacher, speaker and broadcaster, and was the Select Preacher at Cambridge University in 1941. In 1943-1945, he sat on the Bishop of Rochester’s group that produced the report Towards the Conversion of England, commissioned by the Archbishops to identify a mission strategy for the post-war world but had limited impact. Father John was also part of Archbishop William Temple’s Religion and Life Movement, an ecumenical campaign launched in 1940 after the 1937 Oxford Conference on Church, Community and State. After World War II, he toured theological colleges. Then 1946, Father John, appearing as himself, was introduced as ‘Father John’ in Land of Promise, a film about urban housing past, and making a plea for decent post-war reconstruction. The film was directed by Paul Rotha and was narrated Sir John Mills. Meanwhile, he was appointed Rural Dean of Stepney (1945-1956), and in 1947 he was instrumental in setting up Stepney Old Peoples' Welfare Association. He proposed this centre would help, encourage and co-ordinate the activities of clergy and lay workers, train people for religious and social work and for leadership, promote educational and cultural activities, undertake evangelistic work among people not in touch normal parish life, and further the spiritual and bodily welfare of the aged. His ideas found life in 1947 with the proposal to move the Royal Foundation of Saint Katharine back to the East End. But Father John and his colleagues promised that their work at Saint Katharine’s would complement rather than conflict with the work of parish priests in the East End. In 1948, after a sabbatical in Germany, he was appointed the Master of the Royal Foundation of Saint Katharine. While building work was being done, the family lived at 400 Commercial Road, the vicarage of the closed church of Saint John the Evangelist-in-the-East. Father John and his friends then moved into the former Georgian vicarage of Saint James’s on Butcher Row, facing Cable Street, in 1948. They set up a chapel in the bombed-out vestry of Saint James’s Church as they began to rebuild. In 1949, he played Thomas Becket in a film of TS Eliot’s Murder in the Cathedral, directed by George Hoellering, alongside Mark Dignam, Michael Aldridge, Leo McKern and Paul Rogers. Eliot himself was the Fourth Tempter, and Father John’s son Michael was the Third Priest. Hoellering wanted someone with spiritual authority, rather than a known actor, to play the part. Father John let his hair grow long, rather than wear a wig, and entered wholeheartedly into film, with its theme of spiritual defiance of temporal authority. The film was shown in 1952 and received mixed reviews; it was never on general release, perhaps because it was over three hours long. However, Stephen Brown reported in the Church Times earlier this year [29 January 2016] on its release on DVD. Father John and Ethel Upton, another key woman at Saint Katharine’s at this new stage, maintained their links with the trade union movement. Trade unionists were invited to Saint Katharine’s and a centre for the Worker’s Educational Association was set up. There were courses for newly-ordained priests on ‘The Task of the Church in Industrial Society,’ seminars on ‘The Church and Society’ and on ‘The Church and the Trade Union Movement,’ invitations to public school chaplains to experience East End life, and conferences on life in the East End. Informal and confidential meetings between dock workers and management were facilitated, the London Industrial Council met here too, the Metropolitan Industrial Mission was formed here, and there was hospitality for the Old People’s Welfare Offices. Father John remained at Saint Katharine’s for the last 14 years of his ministry, supported by a lay community before it was replaced by members of religious orders. There he wrote Politics & Persons (1949). In 1951, with the local Franciscans, he helped found the Stepney Coloured People’s Association, of which he became President. He retired at the age of 72 on 28 June 1962, and John and Mary moved to Watlington in Oxfordshire in 1962, where they lived in retirement. He died in Watlington 50 years ago on 19 March 1966 and was buried in the churchyard. His papers are held at Lambeth Palace Library. The former Chief Rabbi, Sir Israel Brodie, said Father John embodied the characteristics of the saint, with his Amos-like indignation at the grinding of the faces of the poor and his desire for radical social change. Father John Groser, Rebel Priest of the East End, edited by Kenneth Brill and published last year , tells the story of this heroic priest. Today [20 November 2016] in the Calendar of the Church is the Sunday before Advent and the Feast of Christ the King. It is good this morning to remember a priest whose life was committed totally to live out the values of the Kingdom all his days.